It depends if the light gray things are shadows or not. Remove the optimizations: Filters>Animation>Unoptimize. This create a new image, you can close the source one. Colors>Color to Alpha All layers and remove the background (color-pick, it should be #EEEEEE). Dark grey can darken to black, but don't panic. Image>Interleave layers>Interleave single layer (sprite mode) and select the white layer. This will create a new image, use Filters>Animation>Playback to check it. Set the tools to the "By Color" selector. Layer>Erase background should make the background transparent. 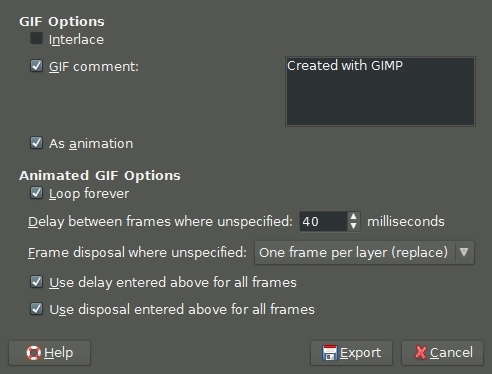 Open the GIF in GIMP, and click Filter > Animation > Unoptimise. This will make the following tasks a bit easier. Go through each layer starting with the top one. With the Select by Color tool, select the grey background. Note: you may have to adjust the Threshold setting in the tool options to get a good selection. Repeat steps 1 to 4 for every layer. There are 68 frames, so it shouldn't take too long. When the GIF Export dialog opens, choose all the settings as below. Note the delay shown is the same delay as the original GIF. Right click the image and go to LAYERS then ADD ALPHA CHANNEL. This create the transparency beneath all layers you will have. Right click on the image again and go to SELECT --> BY COLOR. Click on the color in the image you want to remove. With right click to EDIT --> CLEAR. I'm thinking maybe something like Online image editor would be good enough for this. The transparency removal page is behind the Wizards tab. Not the answer you're looking for? Browse other questions tagged gimp background gif background-removal or ask your own question.